This modern take on the terrarium is composed of a moss micro ecosystem in a recycled wine bottle. Bring the tranquility of the outdoors inside with this mossy microcosm that adds the calm presence of nature to spaces that could use an antidote to daily stress. This modern take on the terrarium features an urbanized micro ecosystem housed within a recycled wine bottle. Made in USA. 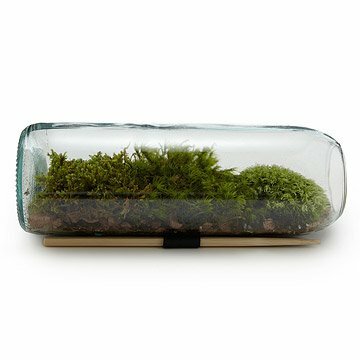 Check out the Gift Lab of the Moss Terrarium Bottle on our blog. Please click here for a PDF of the instructions. *Please note, accessories are not included. Water as needed, keep out of direct sunlight. Moss did not grow after following instructions precisely. Just turned brown after a couple days and died. Very disappointed! my grandson loved this gift! My grandson who is 14 and very hard to shop for loved the Moss Terrarium. It came "thoughtfully packaged and that was also appreciated! Uncommon Gifts is my website of choice for all the folks in my life who appreciate the unusual. It's a lovely idea and a deliciously simple presentation, yet despite following the instructions for weeks, my moss is still brown. Green moss is cute. Brown moss, not so much so. Sadly, not the kind of outdoors that I wanted to bring inside. bummer, dead plants and dirty glass. Loved the idea. Bought the item and followed detailed instructions to assemble. Moss died in two weeks and now looks like dead plant in a bottle. However, the instructions say you can soak the plant and it may come back to life. The reason I'm returning it instead of trying over is this: the glass bottle surface gets smudgy and unclear with moisture, humidity and dried water droplets. So you can't see through the glass to peer at the dead plants inside anyway. Looks like a really dirty window. I bought to display in an exam room but it is definitely not fit to display. For personal use it could be a fun project, but know that it will not look as perfect as pictured. Terrarium is easy to put together - but don't overwater like I did! Follow the instructions and just let nature take its course! All the moss were mushed/tangled together, so I'm not sure if I got two types of moss or all three. Because the moss were mushed/tangled together, even after soaking in the water, it was difficult to separate them and lay them out nicely in the jar. My son and I were very eager to have this. We bought it last winter. It was difficult to get the moss in place. We watered with a spray bottle and it was difficult to water the back. It turned black. Now that there is more light out, it started growing a small plant that wasn't included, but the rest of it is black, and this week it became moldy with a grayish white mold. We're so disappointed. Has anyone had theirs thrive? And if so, what did you do?